Ameriprise Financial's experiment of using a digital agency for traditional ads has ended. Key decision makers in the search include Marie O'Neill, svp of marketing; Bree Sheahan, vp of brand strategy, advertising and media; and Alison Chang, vp of advertising and media, according to a source. Pile + Co. in Boston is managing the process, and final presentations are slated for the middle of next month. Ameriprise's annual media spending has ranged between $30 million and $40 million in recent years, with 2013's total approaching $38 million, according to Kantar Media. Revenue on the account is estimated at nearly $2 million. The TV portion of the assignment was significant for R/GA because it gave the shop an opportunity to go beyond digital marketing and create pure brand ads. 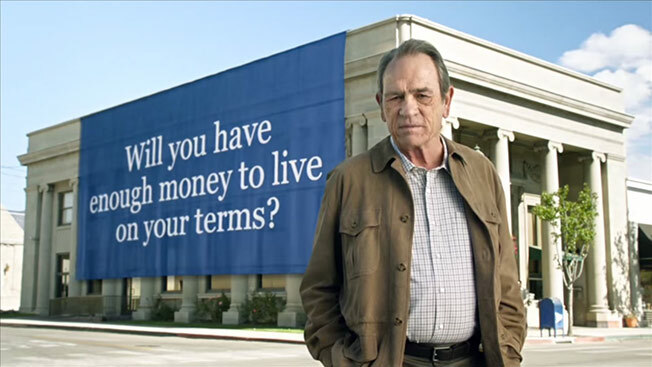 But the current campaign, which features actor Tommy Lee Jones talking about the importance of saving for retirement, is not particularly groundbreaking—especially compared to R/GA's buzzworthy TV work for Beats by Dre headphones. Jones is straightforward and reassuring, while the slow-motion close-ups of athletes in the Beats ads are cool and alluring. Of course, the target audience for each brand is different. Ameriprise seeks to appeal to retiring baby boomers, while Beats is a millennial-friendly brand. Now, Ameriprise is seeking change its strategic direction, sources said. The Minneapolis-based company could not immediately be reached for comment. Media planning and buying aren't part of the review and remain at Initiative in New York. Ameriprise is expected to complete the process by the end of next month.